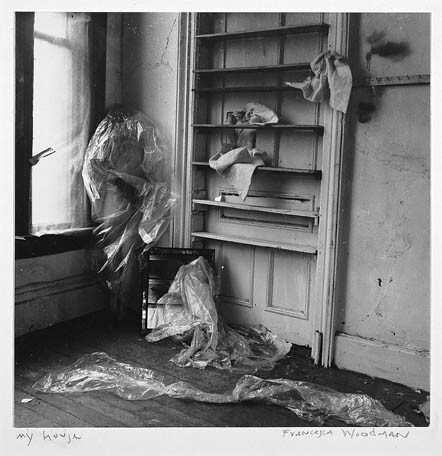 On view in San Francisco for just a few more days are two major photography exhibitions: Ralph Eugene Meatyard at the de Young and Francesca Woodman at SFMOMA. On January 26 Corey Keller, associate curator of photography at SFMOMA, and Julian Cox, founding curator of photography for the Fine Arts Museums of San Francisco and chief curator at the de Young, talked together — via Gmail-chat — about the two artists, their work, and their place in the history of photography. A slightly shortened version of their discussion appeared last week on the de Young’s blog. We offer the chat in its more-or-less “uncut” form. Many thanks to Sarah Bailey Hogarty at the de Young for suggesting and organizing this co-post conversation! Julian Cox: Shall we get started? JC: Both Woodman and Meatyard are so deliberate in their picture-making. Corey, can you comment on that from the Woodman side? CK: What’s interesting to me about Woodman is the way she oscillates between pictures which are very carefully plotted out (complete with preparatory sketches) and pictures that are made in spontaneous response to a situation. And yet the line between these two bodies of photographs is almost indistinguishable. JC: Where do you think that difference in picture-making comes from? CK: For Woodman I think it stems from some kind of inner conflict about her own working method. JC: But she comes to her work as a student seemingly so fully formed. How do you think that happened? CK: The more I learn about Woodman, the less I understand, which is incredibly frustrating. JC: I felt the same way about Julia Margaret Cameron. I spent 10 years working on her, but at the end of it, I still had so many unanswered questions. CK: Woodman was so sophisticated about what it meant to be an artist (due to her family background) and yet so young and, dare I say it, immature that there’s this inner conflict bubbling up. Cameron is actually an interesting comparison for Woodman. I hadn’t thought about that. JC: Her youth allowed her to be so expressive with that conflict? CK: I just think it was who she was, what drove her forward in a way. JC: Do you mean she was wearing her conflict on her sleeve? 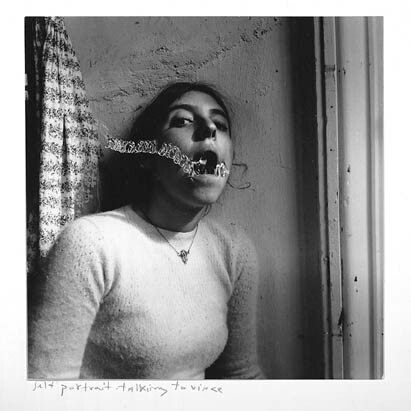 CK: The thing that speaks to me most powerfully in Woodman’s work is the palpable urgency in it. It’s not an idle undertaking. There’s a real need there. JC: Yes. That urgency comes through in the wonderful sense of action, motion, and performance that are so evident in her work. Are you saying that’s in large part reflective of who she is? CK: I think there’s something peculiar to her age that makes those things indistinguishable. She doesn’t have the distance that comes with maturity to draw back and consider [the work] more soberly. JC: We’ve been talking about Woodman as a singular, solitary personality; but one of the things that struck me about the exhibition are the pictures that include other people or models. They are so interesting and among the stronger pictures in the exhibition. We know that she did not operate in complete isolation. CK: So true, and so little considered in her work. She said that she was her own model out of convenience, but obviously it’s much more complicated than that. And the shutter was often pushed by a friend, so there is a collaborative aspect that is often invisible. JC: Don’t worry — we will get to Meatyard, but before we do, I want to follow up on the question of space in her pictures, how she organizes and orchestrates it. What I’m trying to get at is a discussion around the space that she puts between herself and the viewer, and the fact that her placement of herself, in particular, is so careful and specific … Thoughts? CK: It was an explicit concern of hers. As much as she ever talked specifically about what she was driving at, this was something that concerned her greatly. It’s all the more interesting when you consider she wasn’t looking through the viewfinder at the time the shutter was released. It becomes both a formal and a psychological element within the frame. It does seem to me that the square format has a great deal to do with the way space is configured in Woodman’s photographs — but also Meatyard’s. JC: Agreed. One of the things about Meatyard’s pictures, which is so unmistakable, is how he fills the frame corner to corner, top to bottom. Unlike Woodman, he very seldom appears in his pictures, and was always behind the camera orchestrating every square inch of what was in front of him. CK: And oddly, they both use the format to imbue their photographs with an unmistakable psychological charge. Their attention to the relationship of the center to the edges of the frame, which becomes so fraught in a square format, is critical. JC: Absolutely. And thinking about Diane Arbus and, more recently, Roger Ballen, I believe the same thing could be said. JC: Remember, Meatyard was trained as an optician. He understood lenses and the technology of the camera very well and was able to pre-visualize his compositions to a very high degree. CK: Right, I hadn’t thought about that at all. The perspective is the complete opposite of that brought by Woodman, who cared not a fig about her equipment or technical questions. She didn’t work with that kind of precision. JC: Yes, we’re talking about the difference between “expressiveness” and perhaps a more cerebral, systematic approach to picture-making, at least in some respects. CK: Agreed. I’m not sure if that can be accounted for by the difference in age, or the difference in context (Woodman was, after all, an undergraduate art student), or simply that they are different artists. Also, their historical moments, though proximate, are different. 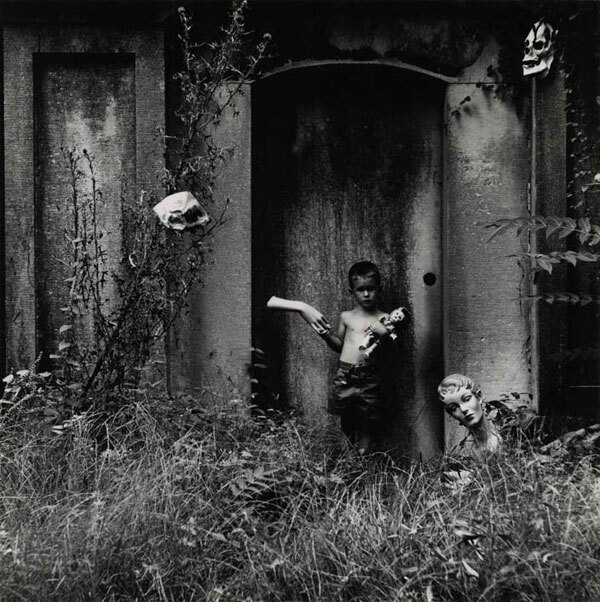 Woodman was working at a time when the kind of photograph she made was appreciated, whereas Meatyard had to wait for it. JC: So well said. The contextual conditions of each artist’s production were very different. Meatyard earned a living 9–5 every day, and we know photographed predominantly on weekends. And his evolving ideas about photography and picture-making were executed in a kind of high-octane, downtime environment. 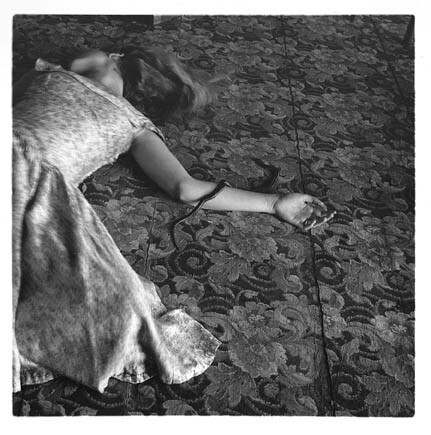 CK: Right, and Woodman’s only job was to make photographs, and this was completely tied to her evolving sense of identity. JC: For Meatyard, there was something very freeing about making pictures, and at the same time, it was a vocation that he took very seriously. CK: I don’t think Woodman found it freeing at all, to be honest. Almost the opposite. JC: And we know that he surrounded himself with poets, writers, and philosophers in Lexington, KY, and the stimulus of those relationships fueled his art. That’s such an interesting comment about Woodman … Are you saying that she was in some ways captive to her art? CK: I realize that I am verging dangerously close to psychoanalysis, but I do think that her art-making had a compulsive aspect to it. She chafed at RISD and wanted to get out of there. I don’t think she found it stimulating at all. JC: Oh, I think the pictures suggest that compulsiveness very plainly. And as for RISD, it seems to me that the pictures and your elegant installation show quite clearly that she was a bit of a fish out of water there. CK: A friend of hers showed me a snapshot of her in front of the student union or some similar building. All the other RISD students are wearing LL Bean down parkas, and she is wearing a thrift-store cape and one of her funny hats. JC: That says it all — thank you for sharing that. CK: It’s a great picture. So droll, and also a little sad. JC: Meatyard was a family man and made his art in a “secure,” controlled environment — something that Woodman clearly never had. Do you think, in any way, she wanted something like that for herself? CK: I think she was conflicted about that, too. I think her relationships with other people were complicated. It’s hard to think of two positions less comparable than hers and Meatyard’s. JC: Yes. What little I have I read about Woodman, and her relationships in particular, confirms your statement. 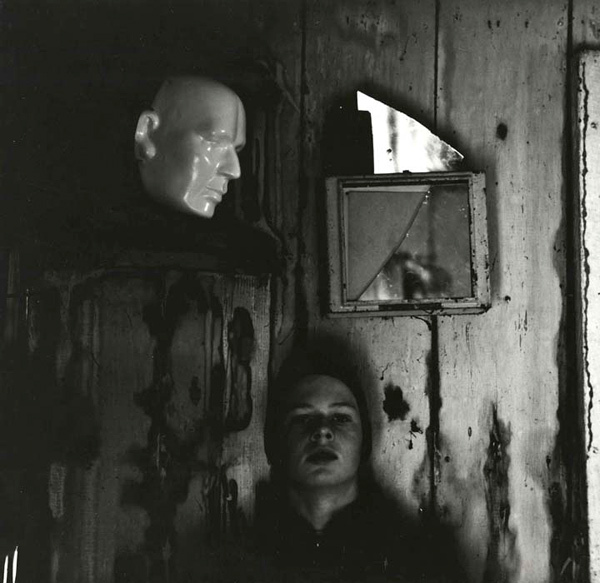 Going back to something you said earlier: You feel that there are so many unanswered questions about Woodman, so is it possible for you to say how you see her fitting in to the history of photography? Or is it simply too early to say? CK: I think there is probably more than one answer to that question. You could consider how she was discovered and received within a context of feminist art history. You could also look at her as a product of the ’70s, in which case, the link to Meatyard is perhaps more germane. CK: That is for certain. Despite her career’s brevity, her influence remains significant, particularly for students, even today. JC: If you look at the history of photography, there are many others who had highly productive but short careers, e.g., Cameron, Le Gray, Arbus, and who knows how many others. CK: Don’t forget Fenton, the lawyer, who after 10 years of being a photographer went back to the law. JC: I want to come back to audience. One of the things about Woodman that strikes me is how insistently she seems to be reaching toward an audience for her pictures. Is that an accurate observation? CK: Yes, I think it is, but maybe not for the reasons one might think. CK: She craved recognition (she had that in common with Meatyard). She knew that being an artist was more than making art, it was being recognized by the system, and she worked ferociously for that recognition. JC: Agreed. But I don’t see Meatyard the same way at all. For sure he was extremely serious about what he was doing, but he was producing his work, I would argue, without much regard for a public audience. CK: I claim no expertise on Meatyard’s work, but it had always been part of the mythology that he felt overlooked by the history of photography. There’s that great story — perhaps apocryphal — of his pasting one of his own photos into Newhall’s History of Photography because he had been left out. JC: That’s true, but at that point, really, how much history had been written? He did have relationships with some of the key figures in the photography world in the ’50s and ’60s, but he did not really “play” them in a strategic way. He cared about how he was positioned, but it did not detract from or influence his practice. CK: I agree, there is a definite distinction. I just think it’s interesting that one of the myths we’re left with about Meatyard (whether it is true or not) is this sense of a slightly outsider position and that it was not entirely willful. JC: Yes, both artists were “outsiders,” but in quite different ways. 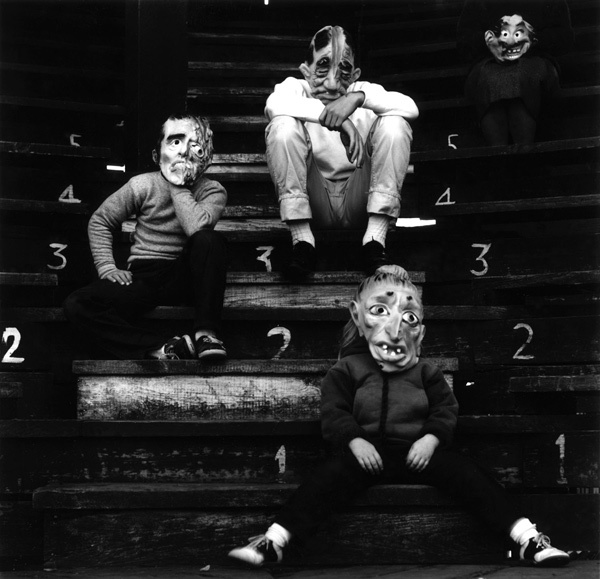 Ralph Eugene Meatyard: Dolls and Masks is on view at the de Young through February 26. 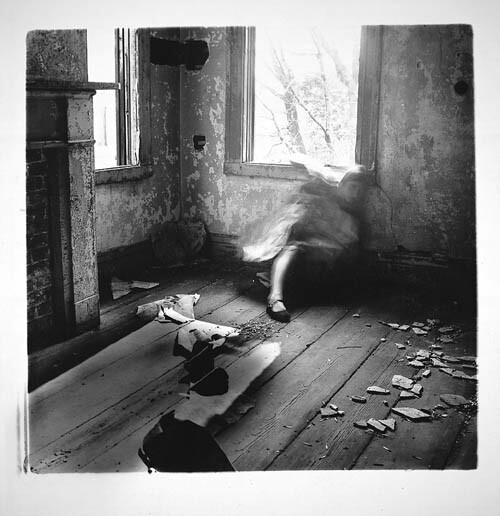 Francesca Woodman closes at SFMOMA this Monday, February 20. “And oddly, they both use the format to imbue their photographs with an unmistakable psychological charge.” This whole conversation is very nicely put!